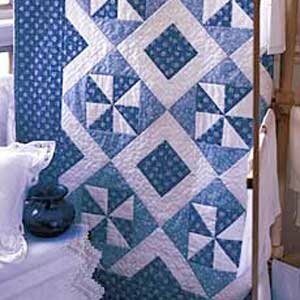 Made with lots of half-square triangles, this quilt is sure to be a favorite. Turn the HST into pinwheels and diamonds and you have a classic, beautiful quilt. Make yours blue and white like Ann's, or make it your own with your favorite colors. "With dozens of daisies spilling playfully across this quilt, you'll be anything but blue. Two shades of blue combined with true white make Ann's design a beauty."